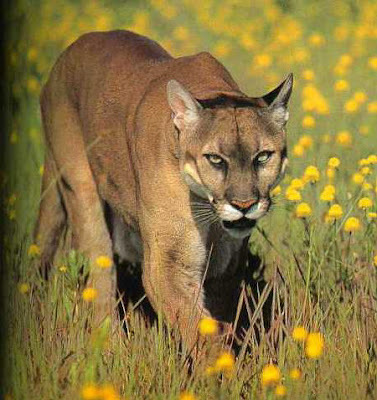 Ananka's Diary: Cougar in Chicago! Yeah, I heard about that. Apparently there's some huge fine for owning a cougar. Who came up with that law? Did they have an uncanny nack of seeing into the future??? The only bad thing is, I live kinda near Chicago. If the story didn't end too well for the cougar, I would be terrified of it coming somewhere near here. Hi! Here's a story about the oldest living tree (they just found it in Sweden, it's been there all this time, you would think that they would have found it before now!). Here's the link again (just in case it didn't work). Lemme guess: The cougar was shot? My school mascot is a cougar, so I feel sorry for it!!! That is soooo sad... It's the way of life that the couger is a preditor, we are predetors too. When we move around the country, do we get shot? No, but when other preditors move around the country, they get shot. People could have handled that a lot better. Transport it back like they do bears would be a much better option. Wow Elizabeth, you can't belive how happy I am because something interesting is happending in Sweden! ^^ But I'm not surprised that they hadn't found the tree untill now. Sweden has a lot of forest, most of the country is forest and that is the reason that there isn't so many people living here. Elizabeth: Thanks for the links! Also, Bringing up Baby is one of my favorite movies, too! Invisible Turtle: Making up a language? Do tell. E-Star: That hotel is really great! But how comfortable could you be sleeping on a bed of ice, I wonder? ugghhh...cruel people deserved to be executed.